Lily was born a healthy baby, but always had an intense cry. I would take her to the doctors continuously from a month old and this was put down to colic, a stiff neck and milk intolerance. At around nine months our concerns began to really grow when Lily began to stop eating and drastically lose weight. Despite us taking Lily to the doctor’s numerous times her condition went undiagnosed. Her skin began to sag and she had a very bloated belly. She was skin and bones. The doctors always commented on how happy she was and that it was a phase she would get through. One doctor simply suggested trying cornflakes. A dietician also suggested putting cream into all her food but the main issue became the fact that Lily just would not eat. 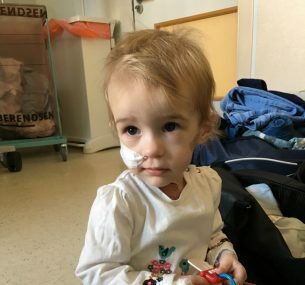 After feeling that my concerns were not being taken seriously, we proceeded to take her to a private paediatrician who immediately referred us for blood tests and a heart scan. Whilst awaiting a heart scan we became seriously concerned for Lily as she suddenly became very lethargic, so we took her to A&E. The doctors were shocked at her condition and immediately put a feeding tube into her stomach and began to run more tests. We stayed in hospital and fed her every few hours but over the next few days she did not gain any weight. They then started to run some genetic tests. 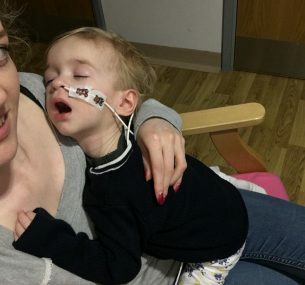 It was only when we noticed that she had developed a nystagmus – flickering of the eyes that she was referred for an eye exam and an MRI scan after nine days in hospital. We were then given the news that Lily had a brain tumour. It was completely shocking and devastating but suddenly everything made sense. 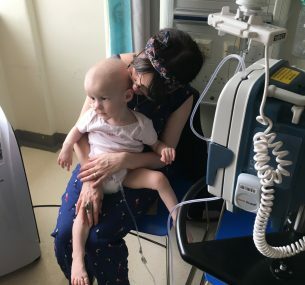 We were then referred to Great Ormond Street Hospital and lily began treatment in the December 2017. Chemotherapy has been very tough on Lily. We have spent many days and nights in hospital as she picks up illnesses quite easily due to having a low immune system. She has also had a number of blood and platelet transfusions because of the chemotherapy. Her diagnosis has been devastating and life changing but so far after nearly a year of chemotherapy the tumour has remained stable so we are feeling very positive at the moment.